Today we got our first glimpse inside the Big Brother 18 house! Entertainment Tonight host, Kevin Frazier toured the house with Julie Chen and posted a sneak peek photo on Instagram. Kevin's caption reads, "Just got a sneak peek at the refurbished big brother house from @JuliechenCBS... there are a few interesting surprises." It's expected that they filmed the house tour for a future ET segment. If we look closely at Kevin's photo, we can see some purple and yellow shades. To me, the yellow area next to Kevin's head resembles that of a travel suitcase. However, that's just what I think it looks like. We won't find out for sure until the house photos are released soon. In addition, Kevin mentions "a few interesting surprises". One of those surprises could be the addition of a brand new pool! 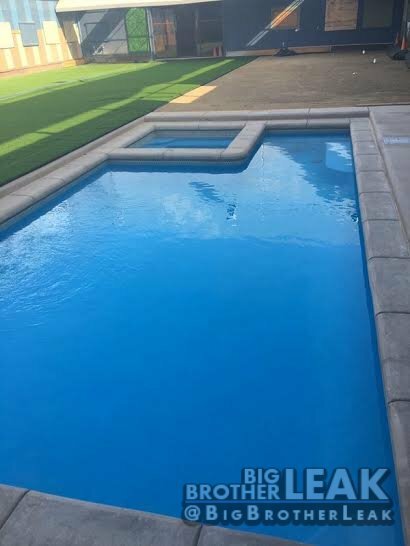 Last week, @BigBrotherLeaks on Twitter tweeted out leaked photos from the Big Brother backyard (click to enlarge images). 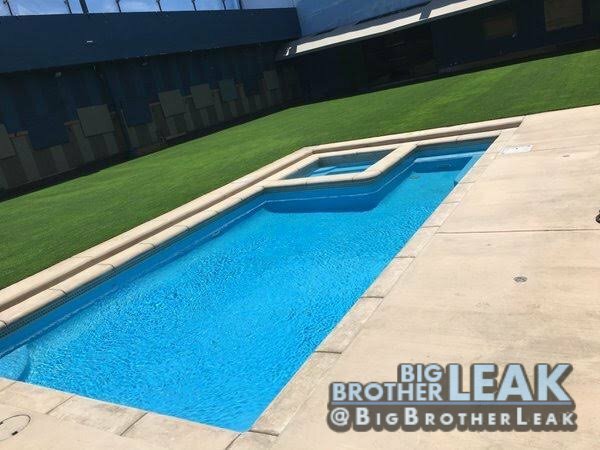 It looks like production has gave the Big Brother pool and hot-tub a much needed remodel. In the images we can see that the new pool is rectangular, and includes the hot tub. The old pool was oval shaped and the hot-tub was near - but separate from the pool. The new pool also has a indent, which will likely allow production to put a cover on the pool that will lay flat unlike with the old pool. The old pool's cover didn't lay flat, it was a box that that went over the it, and thus it made competition designs harder. In addition to the new pool, it looks like new turf has been installed! 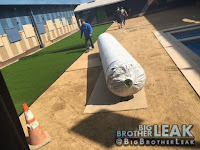 Yes, as many Big Brother superfans know, the grass in the backyard is fake. It's been a few years since new turf was installed, so I can imagine this is a much needed update to the Big Brother backyard. Don't forget, the Big Brother Live Feeds are back with CBS All Access. To get your subscription CLICK HERE! When you do, part of the proceeds go back to us, and help keep TheBBInsider.com running. In addition, if you have an questions about the Big Brother 18 Live Feeds, you can check out our Live Feeds page! Make sure to follow us on Facebook & Twitter for all things Big Brother 18!